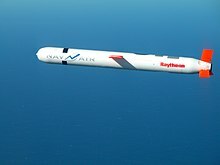 3M22 Zircon Hypersonic anti-ship cruise missile. 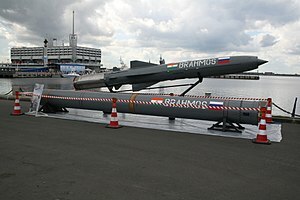 BrahMos-II (~300 km) / is a hypersonic missile currently under development in India and Russia. Kh-90 (3,000–4,000 km) / is a hypersonic air-to-surface cruise missile developed in 1990 by the USSR and later by Russia. This missile was designed to cruise from Mach 4 to Mach 6, eventually being able to travel at speeds lower than Mach 10–15. Korshun a locally derivative of Kh-55 and RK-55, made by Artem Luch Vizar (ZhMZ), KhAZ, Yuzhnoe Pivdenmash, powered by an AI Progress Motor Sich MS-400 like Neptun missile and same builders designer . This page was last edited on 18 April 2019, at 15:22 (UTC).